It's great to share - especially when you find a service that saves you time, money and stress. And it's nice when you get rewarded for sharing. It's even better when your friends get rewarded too! That's what our refer-a-friend scheme is all about. Head to the toolkit and choose rewards, then pick the reward that is most valuable to you. We currently offer a 50% discount on renewal of your premium account, or £5 cashback. Your friends will automatically get a 25% discount on their first year's fees for a Premium account if they sign up in the next 7 days. Once you have picked a reward, you will be provided with a set of sharing tools to help you spread the word about our great service and the discount you can get for your friends, family and colleagues. 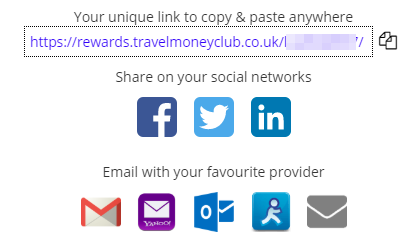 You can use our default shares, customise them to use your own words, or simply share the URL (website link) with your unique referral code. Each time a friend clicks on your post or referral link, we will register the referral. Then each time they sign up to a Premium account, we will log a successful referral and create a reward. You can track your referrals, successes and rewards by clicking on the reward scheme when signed in to the app or website. If you choose free membership, then we will automatically discount your next year's Premium account fee by 50% for each reward issued. 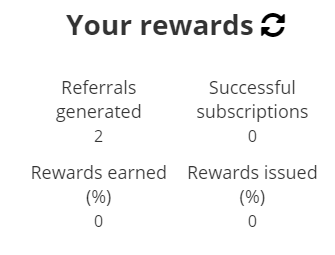 So if you make 5 successful referrals you will get 2.5 years of free Premium account usage. If you choose cashback, then at the end of each quarter we will generate a Paypal payment for the amount you have earned and send the payout link to your email address. So if you make 12 successful referrals then you will received £60. We make payouts in April, July, October and January for the previous quarter. You don't need to do anything to receive your rewards other than make the referrals in the first place. We deal with everything else. Who knew travel money could be so rewarding? This feature is only available to Premium accounts. You can upgrade from a Standard account at any time to access this feature.